All of our patients are unique, but each of their stories share a commonality – it begins with pain, loss of function and then ultimately medical intervention to restore the patient’s quality of life. 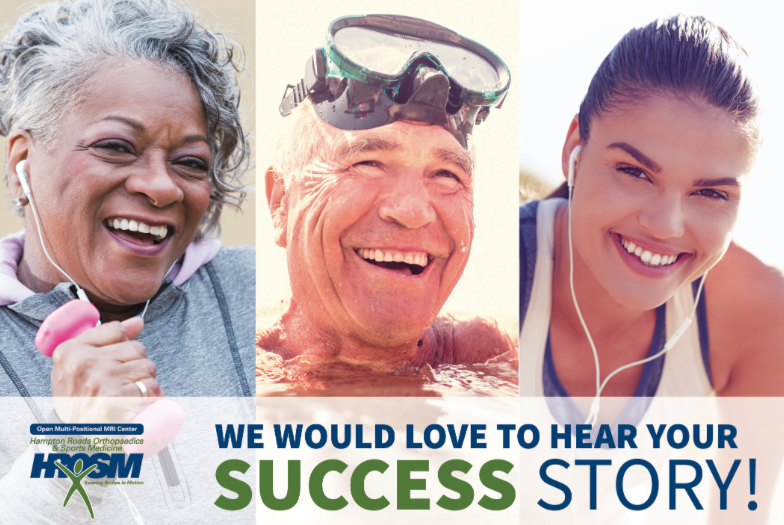 Our greatest rewards at Hampton Roads Orthopaedics Spine & Sports Medicine come from getting to know our patients and celebrating their successes. Our patients are our biggest advocates and we invite you to read their success stories on how interventional medicine and minimally invasive surgical procedures helped them achieve their recovery goals. “We tried managing the injuries with anti-inflammatories, and having Stacia work with trainers to strengthen her shoulders; but despite that, we couldn’t build up the muscles around her shoulders to compensate for the injuries,” Dr. Alexander Lambert II says. Have you received a life-changing procedure or treatment at HROSM? We would love to hear about it! Please fill out the form to submit your story.